Haunted Greetings is the new challenge at IO Stamps! 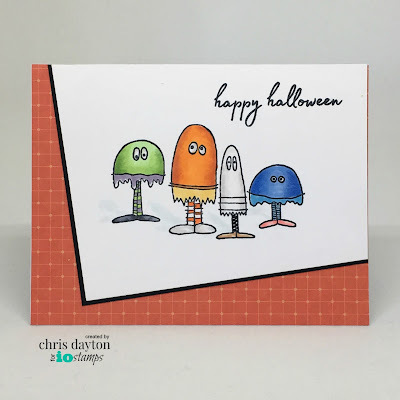 Create an Halloween themed card or project using your IO Stamps! For information on the new challenge and how to enter, please visit the Impression Obsession blog by clicking HERE. A random challenge card will be selected from entrants to showcase on the IO blog and you can be entered to win a $25 gift certificate to IO just by playing! This simple card was created using the adorable Goburglars image. I first trimmed two corners of a 4" x 5 1/4" piece of Hammermill Digital 80# Color Copy Cover paper at angles to create a unique card panel. I also cut a piece of black 1/8" larger using the same angles. I stamped my image using Memento Tuxedo Black ink, then colored with Copic markers, also adding just a hint of shadow behind the images. The greeting from Boo Balloons was also added with Memento ink, and the panel assembled to a white card base using a piece of patterned paper as a background. 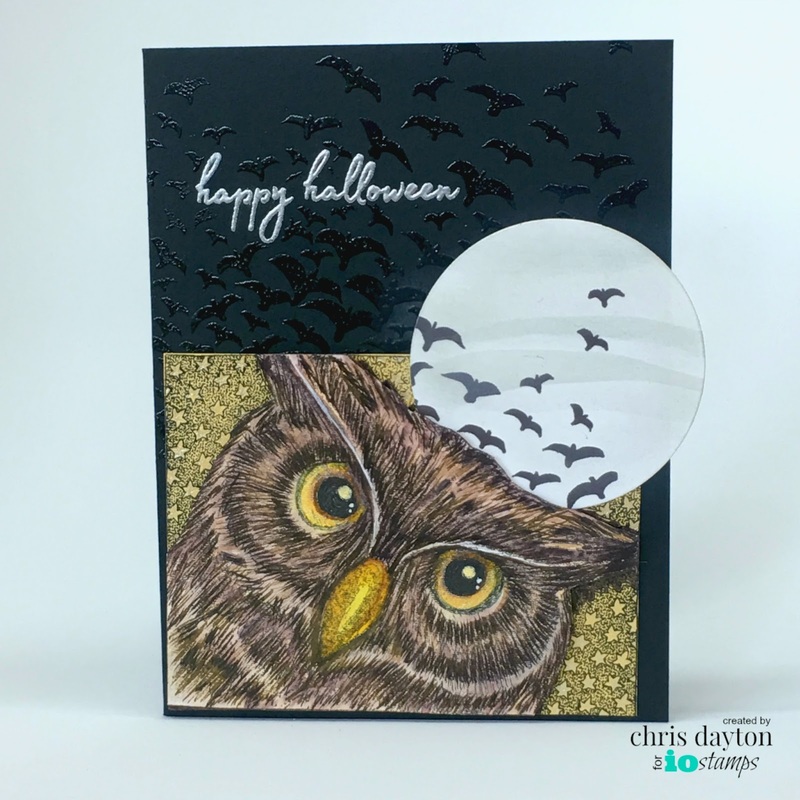 My second card uses the images from Star Owl, Spooky Birds and again uses the Happy Halloween greeting from Boo Balloons. This card was created by stamping the Star Owl image on Artistico cold press watercolor paper with Versafine ink. The owl was colored with Zig Clean Color Real Brush markers, and the feathers accented using a black Copic Multi-liner pen. The Spooky Birds image was stamped on a separate piece of white card stock and a circle die was used to create the full moon. A very pale wash of watercolor created just a hint of wispy clouds drifting across the moon face. I used a craft knife to slice a slit right at the top of the owl's head, so I could tuck the moon behind. The Happy Halloween sentiment was stamped and heat embossed with Wow Silver pearl embossing powder on my black cardbase. I then masked the embossed greeting, and stamped the Spooky birds over the front of the cardbase using Versamark ink. I removed the mask from the greeting before adding clear embossing powder and heating with my heat gun. Then the Star Owl image and moon elements were added. Need more inspiration to get you going? Check out all the projects from the IO Team! These are two very different cards. I like the fun first one. love your goburglers card! the angle of the paper really makes it more interesting!